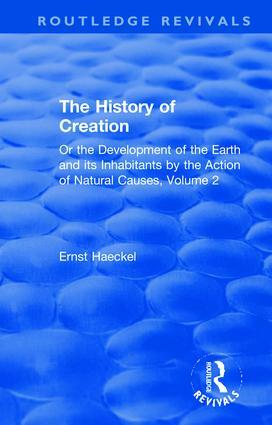 Originally published in 1899, The History of Creation was the first book of its kind to apply a doctrine to the whole range of organic morphology and make use of the effect Darwin had on biological sciences during the 19th century. Haeckel looks at Darwin’s reform of Descent Theory and its establishment through the doctrine of selection. He introduces Descent Theory into the systematic classification of animals and plants and finds a "natural system" on the basis of genealogy - that is, to construct hypothetical pedigrees for the various species of organisms. The book will be of interest to those studying natural history and the origins of modern scientific thought, it will appeal to researchers both in the natural sciences and in history. 2. Scientific Justification of the Theory of Descent. History of Creation According to Linnaeus. 12. Division of Labour and Divergence of Forms. Progress and Retrogradation.